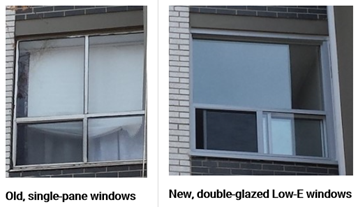 Using funding from the Hi-RIS program, a rental apartment building with 20-storeys and 304 units, completed a $1.3 million window and balcony door replacement. Built in the 1960s, the property owners had not replaced the single-pane windows or wooden balcony doors since construction. The project installation took place from August to November 2015 and lasted three and a half months. The majority of the savings came from natural gas at $85,000 per year. In addition, there are annual maintenance and repair savings of $35,000. Total annual savings resulting from this building improvement are $120,000. Installing new windows and balcony doors will …help to improve our buildings’ energy efficiency, and will increase our buildings’ value. […] We’ll be able to reduce our buildings’ energy usage and operating costs going forward in perpetuity, while increasing NOI, cash flow and property values.